GREENBURGH, New York (WABC) -- An elderly man in Westchester County charged with unlawful surveillance Thursday night after a picture of a naked toddler was allegedly found on his iPad. 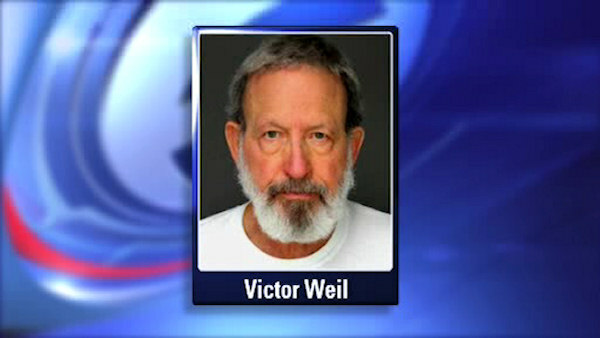 71-year-old Victor Weil was arrested after guests at a hotel in Ossining spotted him photographing children at the pool. When he was asked to delete the pictures, guests noticed the naked photo that was apparently taken from Weil's balcony. It appears the child had just been changed by the parent when he appeared naked at the slider door of the room which is on the ground floor facing the pool area. Victor Weil surrendered to Greenburgh Police and was arraigned and remanded to Westchester County Jail bail was set at $5,000.00 cash or $1,000.00 bond.